Modern elegance meets timeless sophistication in the Sottero and Midgley Margot wedding dress. Featuring a plunging V-neckline, Swarovski crystal beaded bodice, and a ball-gown skirt with box pleats and pockets, this is one chic gown you don’t want to miss. The Mikado fabric is structured and formal, and though it holds its shape it’s still soft and supple. The plunging V-neckline is contemporary and daring, while thick straps add support and security. If the deep plunge isn’t your style, a detachable, beaded modesty panel is included. 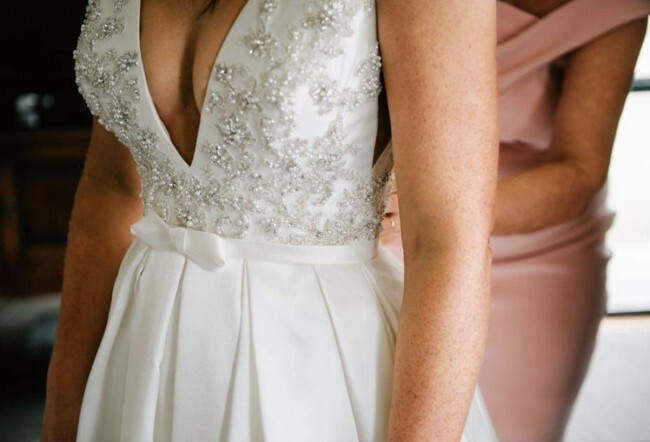 The bodice is encrusted with intricate Swarovski crystal beading, with catches the light and also highlights your figure. A self-tie fabric belt at the natural waist ties in a minimal bow for an added detail that flatters your figure even further.